In the previous section, a sample was dated using an experiment. 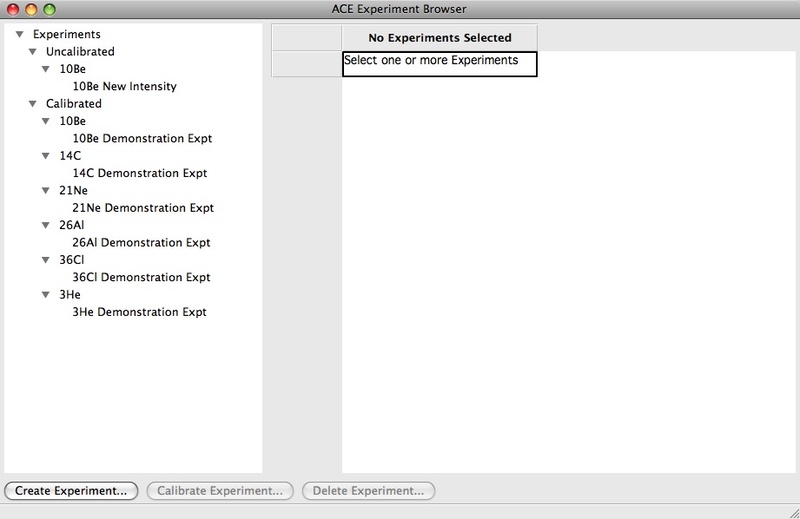 The purpose of experiments in ACE is to test the effect of theory on calculated ages. 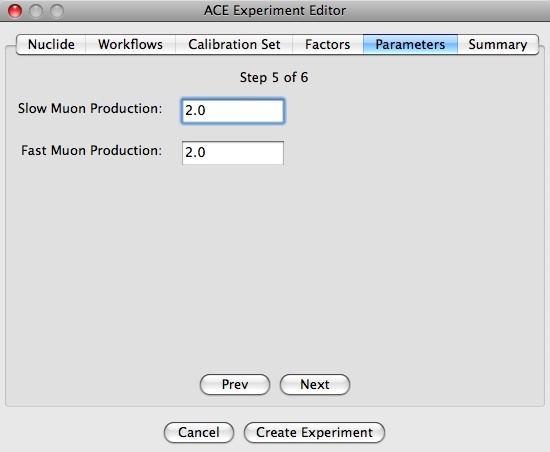 For example the sensitivity of calculated ages to muon contributions can be determined by making an experiment with no muon contributions, another with muon contributions, and comparing calculated ages calculating using both. 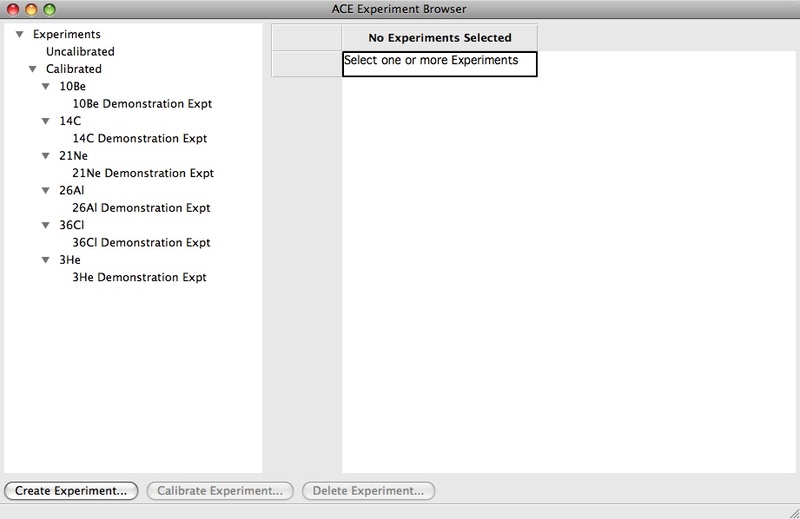 To make a new experiment we begin with the experiment browser, which can be invoked by clicking on the ‘Make Experiment’ button at the bottom of the sample browser. From this view we can see that the 10Be Demonstration Experiment uses Guyodo and Valet (1999) geomagnetic intensity changes, and has a calibration HLSL spallation production rate of 5.07 ± 0.33 atoms per grams per year. 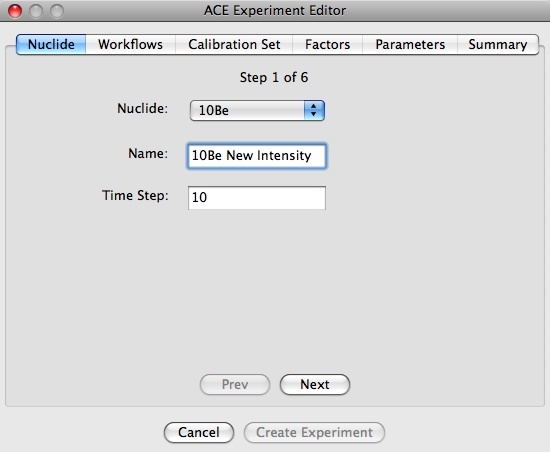 Choose a timestep (10 yrs, same as for the demonstration experiment). This is step 1 of 6. 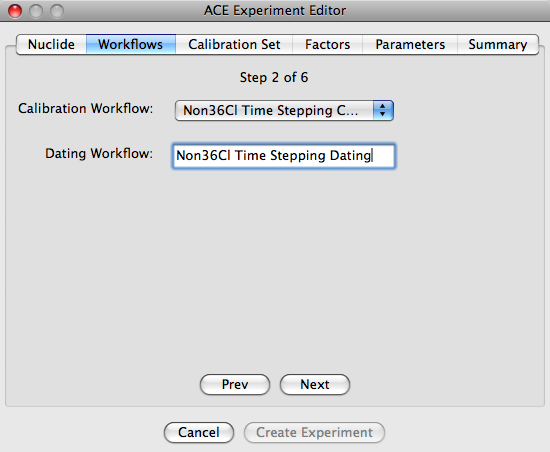 To continue we use the ‘Next’ Button, or select the next panel at the top named ‘Workflows’. 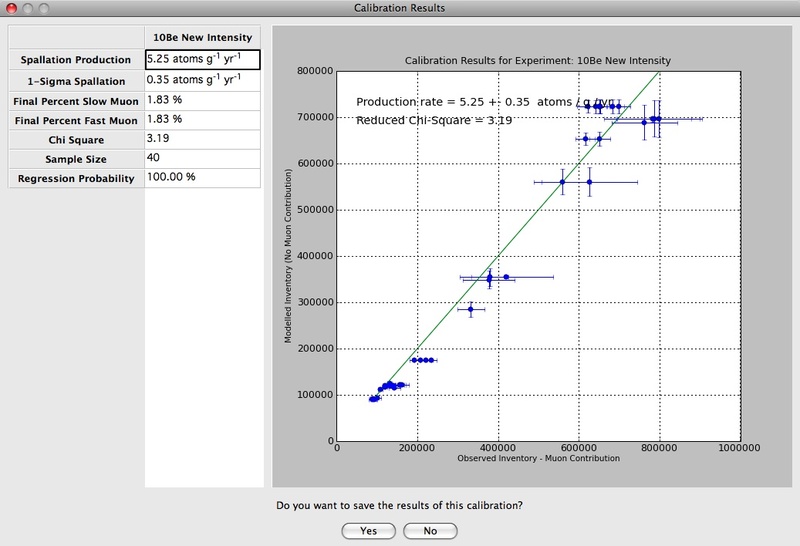 The calibration set selects the group of independently dated samples from which to estimate HLSL production rates. 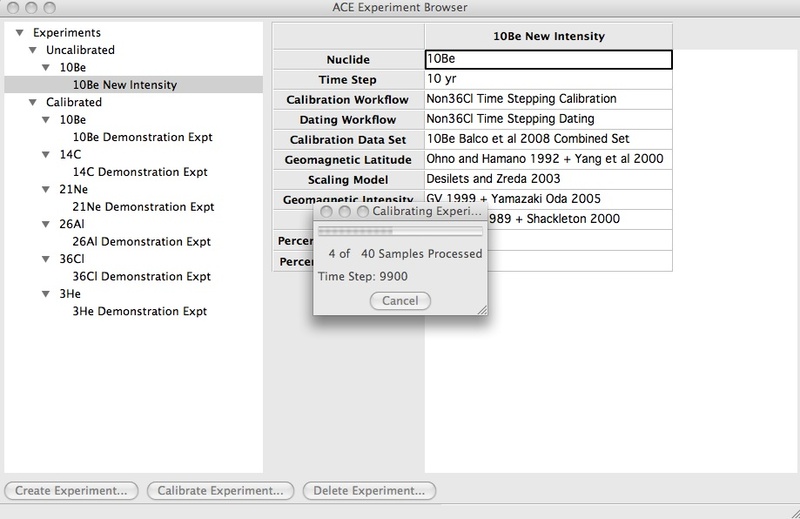 New calibration sets can be imported into ACE just like normal samples, but they need the additional attributes ‘independent age’ and ‘independent age uncertainty’. 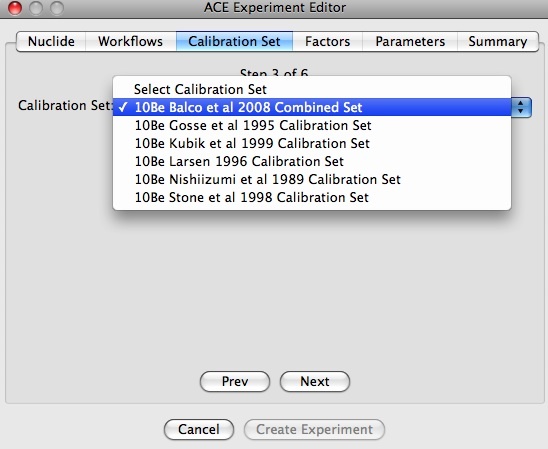 New and existing calibration sets can viewed using the calibration set browser, and sets can be regrouped using the group editor. The original data sets are given as csv files on the ACE website (see here for 10Be), allowing for easy access. 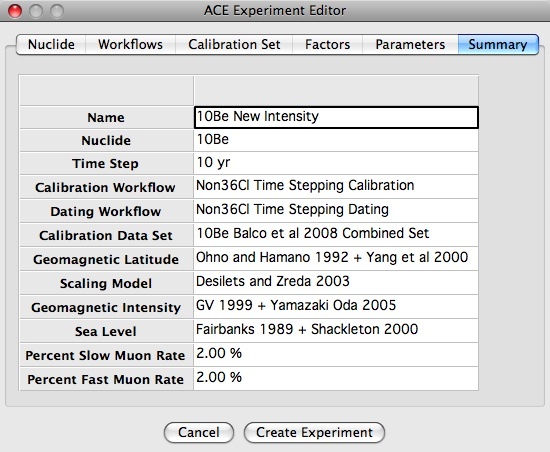 We choose the Balco et al (2008) combination calibration set here, as the same set was used in the demonstration experiment, and we only want to change geomagnetic intensity. 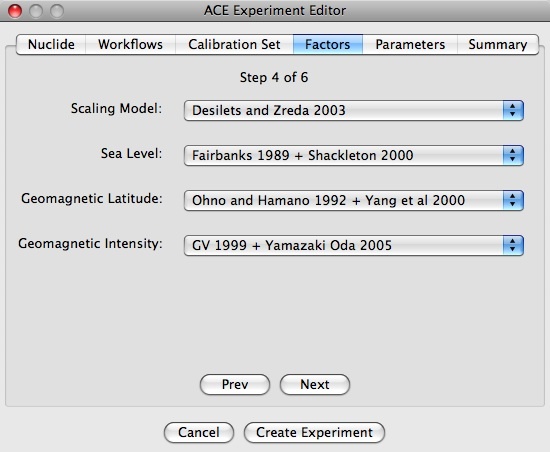 When this calibration set is selected, we continue by selecting ‘Next’, to the panel named ‘Factors’. 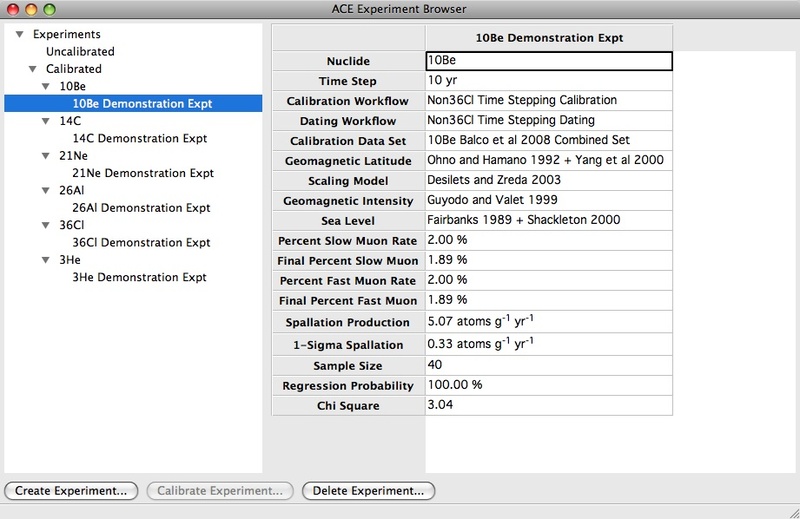 So from the above we see that the 10Be samples supplied with ACE are sensitive to the record of geomagnetic paleointensity changes to a few hundred years.